At the start of primary school life for my brother and myself, our family shifted into the “City” of Gympie from our quiet rural life at Widgee. The busy traffic and the large commercial vehicles were a revelation to us. Towards the end of my primary school life at Gympie Central School the Second World War was in progress and the older girls, organised by the teachers, were busy knitting socks and scarves for the soldiers. When I entered the Gympie High and Intermediate School, this proved to be a daunting experience as it was so different from anything I had previously experienced. As I lived on the outskirts of town, quite a distance from the Gympie High School, transport was a problem. My mother bought me a bike which we thought of as a luxury. I rode to a friend’s place just below the Drill Hall in Duke Street and then I caught a bus which would convey us to school from the Freemasons Hotel and of course reversed this procedure on the homeward journey. The fare as I remember was four pence (4d). Because this dreadful global conflict was still enveloping so many countries and food and clothing rationing was enforced, we were not compelled to surrender any of our precious clothing coupons on uniforms with the result that our school photo presents a varied range of dress. One of the parade grounds was dug into trenches to shelter the students in case of Air Raids. We had drills to practice this manoeuvre. Our domestic science lessons were conducted in a separate building where the windows provided a good view of the Railway Line. The son of our teacher (Mrs. Stormonth) was scheduled to be on the troop train with many others being deployed north for further duty. We joined our teacher at the windows waving our tea-towels frantically. We like to think that John recognised the building and saw our farewell. Before the end of my High School days, the war came to an end and we were able to hold our Speech Night in peace without the fear of disturbance. I still have in my possession the books I was awarded as the recipient of the Gerald Meredith Music Prize. 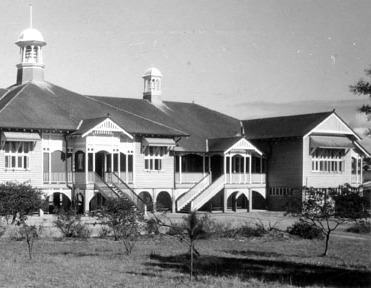 Gympie along with its schools have changed in many ways and confront new challenges but I am happy to see and hear from former school friends who look back on those years with fondness despite the difficult conditions.